New York Attorney General Eric Schneiderman said that evidence of the fraud perpetrated by Trump University is "pretty straightforward." "It [was] a bait and switch scheme," he said on CNN's New Day Friday, defending his and other lawsuits against the school. "He did ads saying my hand-picked instructors will teach you my personal secrets. You just copy what I did and get rich." But Schneiderman said evidence in the case makes clear that Trump was not involved in hiring instructors, and that he didn't create the program's curriculum. "If you tell people we're going to teach you Donald Trump's secrets, and he never had any part in writing the curriculum, that's fraud," Schneiderman said. Schneiderman said thousands of students paid millions of dollars to the school, which closed in 2010. While the attorney general's suit is a civil suit rather than a criminal action, Trump could face millions in fines, Schneiderman said. "This is the equivalent of putting up a sign that says Trump Hospital, when it's not, and the people in it aren't nurses and doctors," he said. Trump has charged on the campaign trail that Schneiderman is pursuing the case after he received a campaign contribution from lawyers representing students in a civil lawsuit. He also says that Schneiderman filed the suit after meeting with President Obama during a presidential trip in upstate New York. He said he received a $10,000 donation in 2010 from one lawyer at a large law firm that filed one of the cases against Trump. But he points out that's less than the $12,500 that Trump himself contributed to Schneiderman's campaign. "Obviously, I'm not motivated by money since he gave me more money than anyone even tangentially related to the other side," he said. And Schneiderman said he never discussed the Trump case with Obama before filing it. 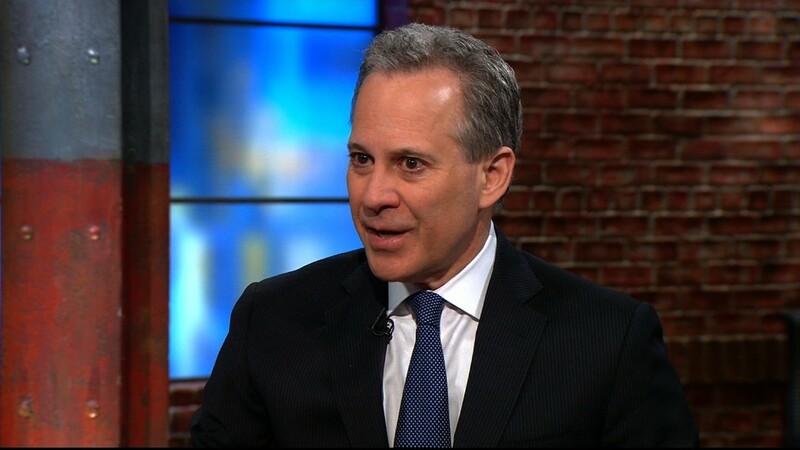 "In 2013 when I sued him, we had no idea he was going to run for president," Schneiderman said. "This was just a straight up fraud case. It was not a political thing at all." This week a New York appellate court rejected a motion by Trump's lawyers to toss the case out of court. That clears the way for it to go to trial, although Trump's general counsel said he intends to appeal to the state's highest court. Trump could end up being called to testify in the case. Trump is already slated to be a witness in a federal civil case brought by students in California, and he recently gave depositions in a second federal case. He could testify in Schneiderman's case as well. Schneiderman said he's looking forward to Trump's testimony. "When you're in court, when you're dealing with the legal system, you can't make things up the way you can in a campaign," he said.